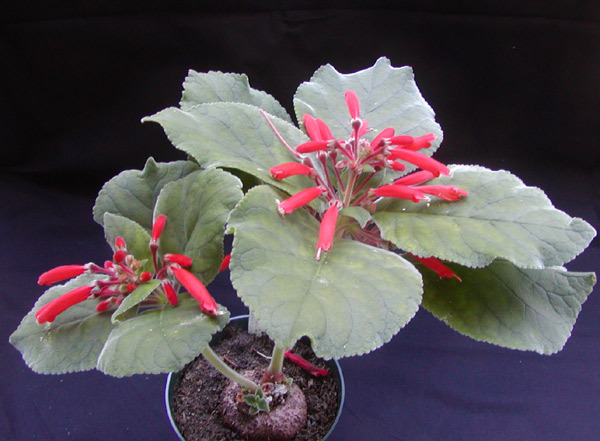 I grew S. leucotricha x cardinalis seed from the Gesneriad Hybridizers Association Seed Fund. Most of the resulting plants were S. leucotricha, but one was definitely a hybrid, with reddish flowers and cardinalis-type foliage which was nonetheless somewhat hairy. This is shown in the picture. Like many sinningias, this one has improved with age, putting up more stems and more flowers every year. In crossing S. cardinalis and S. leucotricha, one would be hoping for leucotricha foliage and cardinalis flowers. Unfortunately, what one gets is more like cardinalis foliage and leucotricha flowers. I have selfed this plant, and also back-crossed it to S. leucotricha (including the "Max Dekking" form). 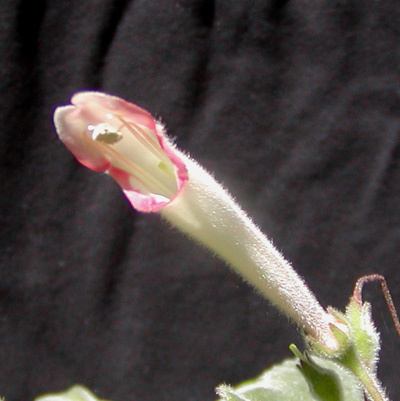 These seedlings have flowers of the leucotricha type, with foliage about halfway between this hybrid and leucotricha. Given Vincent Parsons's experience (see the douglasii x leucotricha page), this may be a long project! On the other hand, given how long these species have been in cultivation, if cardinalis flowers on leucotricha foliage were easy, it would already have been done. In 2008, I crossed this plant with Sinningia iarae. Here is the first flower on a seedling from this cross [August 2009]. Hybridizing is so predictable. Orange-red x dusky pink equals ... white with a pink fringe? The main point of interest here is that the flower has a galea. Since S. cardinalis x leucotricha (galeate x non-galeate) does not have a galea, we tentatively concluded that the galea trait was recessive. If the presence of the gale were controlled by a single gene, S. iarae x (cardinalis x leucotricha) would then have a 50% chance of having a galea (receiving the cardinalis gene from its pollen parent rather than the leucotricha gene). When more of the seedlings bloom, I'll be able to get a better idea of whether this is indeed the case. Fertility This hybrid is very fertile, and I have done numerous crosses with it.